Chamomile is one of the old favorites in traditional herb gardens and kitchens and is still a popular herbal medicine throughout the world. The name stems from Greek “ground apple” for its lovely apple-like scent. In Spanish the name Manzanilla (“little apple”), describes the same. The two most popular types are German chamomile (Matricaria chamomilla/recutita) and Roman chamomile (Chamaemelum nobile). Though different species, they are used to treat the same common ailments, however German chamomile contains much higher amounts of azulene, an important medicinal oil. Chamomile flowers resemble the daisy with white petals circling a cone-shaped yellow center and depending on conditions, bloom between May and October. German chamomile leaves are fern-like light green and feathery whereas Roman chamomile has finely divided parsley-like leaves that are thicker and flatter. For growing, German chamomile likes poor, clay soil whereas Roman chamomile prefers well-drained and moderately fertile soil. Although both chamomiles thrive in open, sunny locations, Roman chamomile will not tolerate hot, dry weather. There are other wild chamomiles, common to foragers, for instance, the well-know side-walk variety Matricaria discoidea, commonly known as pineapple weed whose leaves, have the lovely scent and can be used as a tea or in salads in a similar manner (the flowers are more bitter). Wherever you travel and ask for an herbal tea, you are bound to have two consistent choices: mint and chamomile – and that’s a good thing! Chamomile’s most popular use is to calm upset stomach and nerves. It is combined with fennel and/or dill in baby ‘Gripe Water’ for colic and included in many intestinal soothing formulas as well as parasite formulas. You will also find it a primary ingredient to sleep formulas and one reason is that chamomile has two flavanoids that, like Valium, interact with GABA (gamma amino butyric acid) receptors on nerve cells, slowing them down. These flavanoids are only water soluble in chamomile because they are attached to sugars when you drink the flower tea, then your gut bacteria release the flavanoids for absorption by your body. A strong tea of chamomile can be quite bitter and therein lies its medicine as a powerful yet gentle mover of the liver and bile in the gallbladder. In many countries a strong chamomile tea is drunk after a night of over-indulgence! The pollen of both chamomiles have molecules that serve as antagonist to pain receptors, thus may lessen the sense of pain in the brain (and our gut which is a nursery for brain neurotransmitters). Chamomile along with California poppy (which has a similar effect on the brain) should be included in chronic pain relief formulas. Chamomile speeds wound healing, and is highly anti-inflammatory so makes an excellent poultice for sunburn or sore muscles. It works by reducing the production of enzyme COX-2 that is associated with chronic inflammation used internally as tea, capsules or tincture. Chamomile’s oil is a deep blue due to the presence of azulene, which is both anti-inflammatory and anti-bacterial. It makes a great facial or sinus steam for bacterial acne or sinus infections and combines well for this purpose with yarrow flowers. You can also use a strong fresh chamomile tea in your netti pot for a nasal wash. Long used in Europe for dental issues, tincture of chamomile reduces mouth infections, abscess and complications from periodontal diseases. In such cases, combine with tinctures of Oak bark and sage. 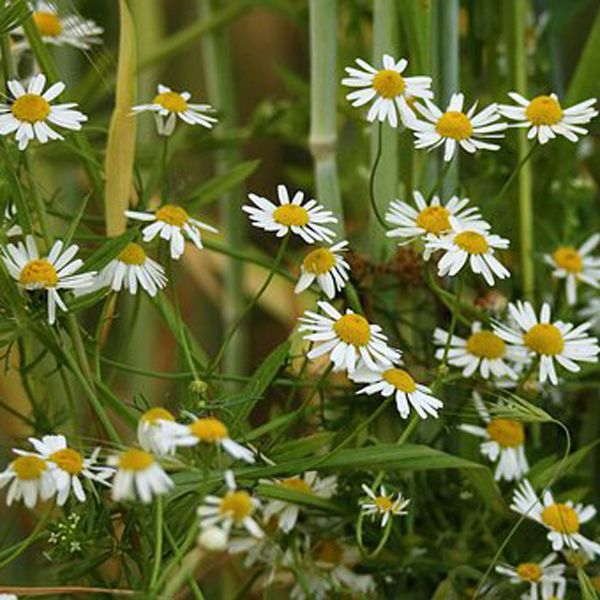 Finally, Chamomile has long been used in body care products because it is cleansing and brightening to hair and skin. Make a strong quart of tea to use as a hair rinse to ‘lighten’ dark blond hair and use as a facial toner to repair sun-damaged skin. Of course you don’t need a reason to use this wonder-herb! There is still nothing so pleasing at the end of a long day, as to enjoy a cup of chamomile tea with your favorite local honey . . .ummmmm .